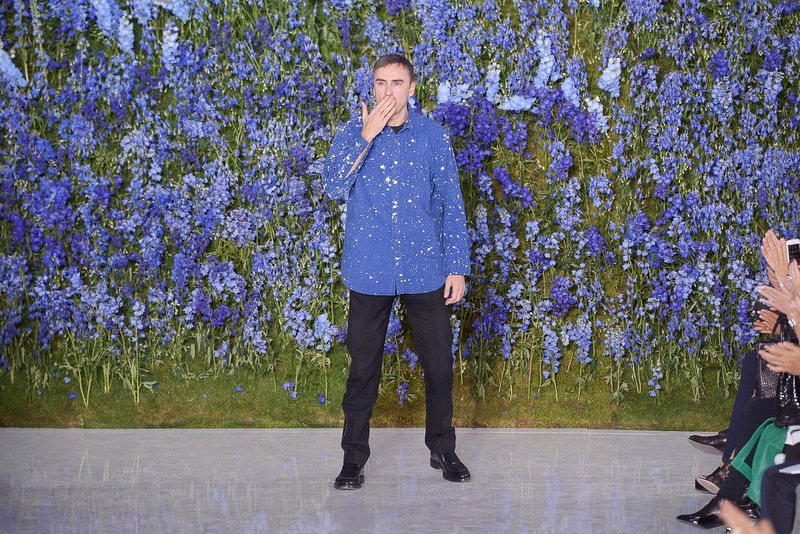 On Thursday some parts of fashion folks were shocked, other cheered, by the news of Raf Simons parting ways with Dior, as he didn't renew the contract that had ended on May as creative director. Mr. Simons spring 2016 collection was his last, and his successor has yet to be announced. "It is after careful and long consideration that I have decided to leave my position as Creative Director of Christian Dior Couture Women's collection. It is a decision, based entirely and equally on my desire to focus on other interests in my life, including my own brand, and the passions that drive me outside of my work. Christian Dior is an extraordinary company, and it has been an immense privilege to be allowed to write a few pages of this magnificent book. I want to thank M. Bernard Arnault for the trust he has put in me, giving me the incredible opportunity to work at this beautiful house surrounded by the most amazing team one could ever dream of. I have also had the chance over the last few years to benefit from the leadership of Sidney Toledano. His thoughtful, heartfelt and inspired management will also remain as one of the most important experiences of my professional career." As I wrote in my review for the Dior spring 2016 show, I wonder whether clothes were not enough to deliver the ideas, the vision, and the fantasy a designer has in mind, as it seems to me that grand staging was always present for the runway show. Apparently not, as he reportedly wanted more, as his vision to shape the new Dior was clear, bringing Dior to the contemporary state that is, making it relevant and more 'wearable'. Unlike Karl Lagerfeld of Chanel or even Hedi Slimane of Saint Laurent, who aside from collection shoot the ad campaign and in later case design the store, Mr. Simons didn't get such opportunity due to, according to him, lack of time. A sentence from Alber Elbaz of Lanvin as he accepted the Superstar Award at the Fashion Group International annual gala sounded like he gave a nod to that, stating that "[I] think that everybody in fashion these days needs a little bit more time". Or perhaps a kind of contract that Karl Lagerfeld has, for it is a life time contract and he is free to do anything regarding the brand. Would that be too much to expect? Because ironically, these people, who work in luxury companies, don't have the ultimate luxury, which is time, for they have to compete with fast paced street labels such as Zara and H&M, which, in certain point, have relevance to the mass more than actual fashion houses do to their similarity in design but with lower price point and/or collaboration with designers from big fashion household (Both Mr. Elbaz and Mr. Lagerfeld did contribute to the H&M collaboration, and are therefore indirectly responsible for this trend of fast fashion). So naturally the discussion about who' going to fill the shoes follows. Who's worthy, creative, powerful, and visionary enough to helm one of the biggest fashion houses in the world? A lot of aspects to consider. However, learning that Dior has six collections to show a year and each demands full focus and strength, he (or she, I am not judging), should not have his or her own brand bearing their name. If what Mr. Simons needed was time, juggling between two brands (or worst, two brands in two different cities) would be another time bomb. Recalling that the downfall of John Galliano from Dior was partly caused by too much pressure and work, taking someone with already an eponymous label in hand would not be effective in long term. The best solution, is by example in the case of Maria Grazia Chiuri and Pierpaolo Piccioli at Valentino, as well as Alesandro Michele at Gucci (even though the later needs a little more period to proove it). They came certainly not out of nowhere. They were in-house designers before they were appointed as the creative directors. With immense understanding of the aesthetic of the house, the experience, and familiarity with the rest of the team make transition on the new post relatively easier. The idea of Ricardo Tisci, Nicolas Ghesquière, or even Phoebe Philo as the new head designer of Dior (as Cathy Horyn suggests) frightens me. When are they going to learn, that such thing- picking designer from one fashion house to be put to another- is risky, first and foremost from psychological point of view? Such shake-ups will result instability and uncertainty from business perspective. Furthermore people will compare whatever they put onto runway to their previous works at different houses, and by assuming that the new designer is aware of this, it would not give him/her space to really start anew, which what Dior needs the most. Paying homage to the founder and archieves the house would certainly be the idea of the first collection, and what we will see is another rendition of Bar Jacket/The New Look. Dior seems disconsolately stuck in the good ol days, anxious of any semblance of infidelity to the memory of Christian Dior while still chasing after novelty, innovation, and eventually, profitability. Not an easy job to balance them, as we have heard many people longing for the glamour and drama that's been Dior's DNA but recently revamped under Raf Simons' three-year tenure. So what choice do they have at Dior? What about Bill Gayten, the once right-hand of John Galliano? The fact that he's designing for John Galliano (the brand) is not so bothering, for what they need to do is to change the contract. He did collection for Dior before, when John Galliano (the man) was dismissed from the house of Dior and his namesake label. He likely gets the spirit of the house better than other kids, as he has been in the house more than two decades. The cards are shuffled. The game is on.